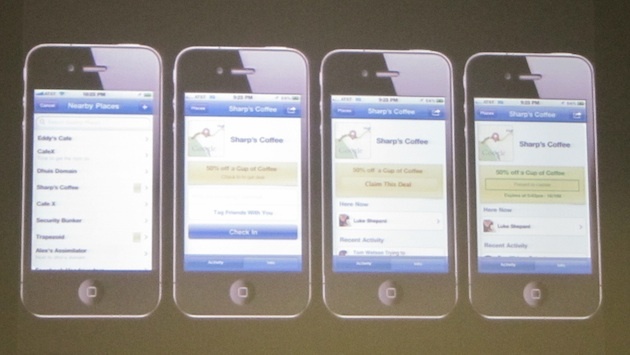 Today at Facebook’s event in Palo Alto, CA, the company had a lot to say about their mobile platform. Yes, they had updates to their Android and iPhone apps. And yes, the company implemented a new single sign-on process. 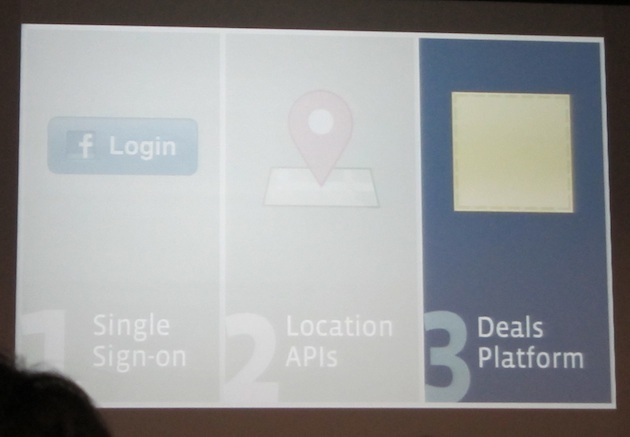 And yes, they unveiled a new location write API. But the thing they announced that may have the biggest impact is Deals. There has been a lot of talk about Facebook launching a Deals product ever since talk about them entering the location space began. Some people were disappointed when Facebook Places launched without any deals. Well, they’re not going to be disappointed anymore. Facebook is launching Deals with 22 premium partners today. And they’ve giving 20,000 small and medium sized businesses on Facebook access to their new simple Deal creation tool. So what are some of the deals? 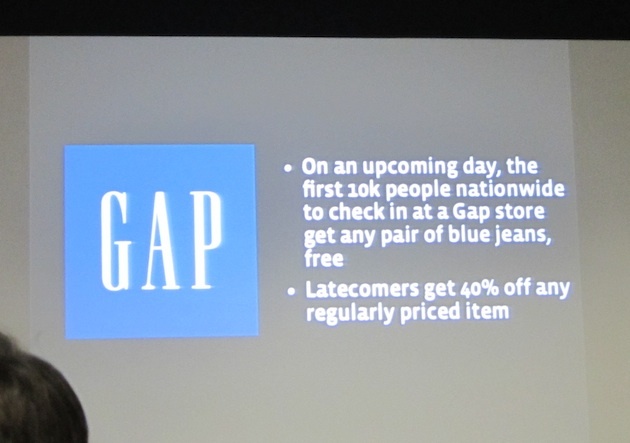 Gap is giving away 10,000 free pairs of blue jeans. And when they run out of those, they’re giving 40 percent off of any product when someone checks-in to any of their nationwide stores. A smaller cinema chain, Alamo Draft House, is giving away a free pint glass when you check-in. And they’ll have offers for special events for friends. The North Face is giving $1 to charity for a store check-in or a check-in to a number of national parks. The Palms hotel in Las Vegas is giving away a free third night when you stay for two nights. Or you can get a room upgrade. The Golden State Warriors are giving away access to a free event with players if you check-in to a game. As you can see, these deals are a mixture of nationwide and local. And there are a mixture of deals for products and deals for charity. And there are deals for individuals and deals for friends. The social element is key to these Deals. There will be a way to share deals with your friends. You can check-in somewhere and tag your friends so they all get the same deal. This is very nice. And claiming these deals is as easy as two clicks. It will be very interesting to see what this means for smaller location services like Foursquare, which has been ramping up these types of deals in recent months. Will it be a case of all ships rising or everyone going over to Facebook? It will also be interesting to see what this means for group buying companies like Groupon. Facebook hasn’t specifically stated anything in that direction — but you can easily see them going in that direction too. Again, this could spell trouble for rivals. Many of them began by offering free access to deals with the intention that they might get paid for them eventually. But who would pay another service for this when Facebook is offering it for free? And Zuckerberg noted today that Places is already several times larger than any other location-based service out there — something which is pretty amazing considering it has largely been iPhone-only up until now. Also interesting: what does this mean for Google? They are also pushing hard to ramp up Places. 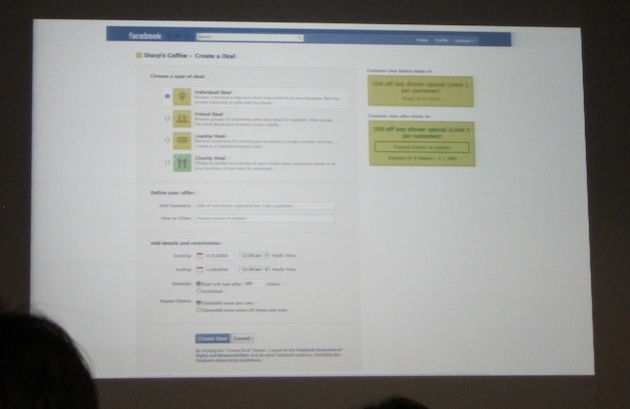 Facebook noted that in the next couple of months the Deals tools will roll out to all Facebook page owners. Currently, Deals will be U.S.-only for now, it will roll-out internationally over time.